A great surprise for my afternoon. I was sitting at my workbench when I noticed movement right outside my window. 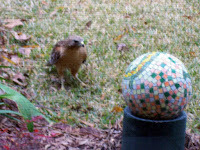 Looked at, and there was this hawk, not 6 feet away from me. We have alot of birds (which we invite with the 4 birdfeeders and two baths), and of course an entire community of squirrels, which brings the hawks and the two owls to our area frequently. Usually, however, the hawks and owls sit on the fence or a tree branch. This is the first time one has come this close. To bad the window screen distorted the picture.